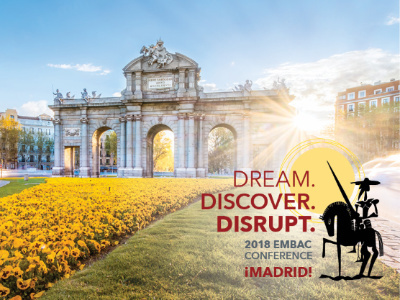 In this Q&A, conference co-chairs Matthew Gibb of HEC Paris and Maria-Eugenia Marin from IE Business School explain why the 2018 conference in Madrid is one hot and valuable event. Why should EMBA community members attend the conference? MARIA-EUGENIA: Like all annual conferences, the Madrid conference will offer participants an opportunity to share experiences and best practices, network, and learn about new trends and challenges in the EMBA space. This year’s conference location is especially exciting because it will reinforce the EMBA Council’s international reach and vision, as well as its commitment to being the global voice of the Executive MBA industry. MATTHEW: I think it’s great to see the EMBA from outside of the North American perspective. We really hope to have a lot of European colleagues participating, and I think that brings great energy to the conversations and many opportunities to make new connections. What makes the conference unique? MATTHEW: For me, the conference is where the magic happens. You may be sitting with coffee during a break and a member might come over and make introductions. Those conversations can be so valuable. I think it’s important to create those opportunities to share information over a cup of coffee, and the conference does just that with colleagues from throughout the world. MARIA-EUGENIA: We’ve made an effort to give the conference a European, but also global focus so that members can learn more about the EMBA space in other parts of the world. For example, the first plenary includes business school deans from four countries and three different continents who will share their thoughts on the EMBA industry from where they sit. This is important because management education is not the same everywhere in the world: the challenges, needs, and contexts are often very different, even among countries in the same continent. Nick van Dam, global chief learning officer for McKinsey who is Dutch and based in Amsterdam, will also be able to shed light from a more European/global perspective. What are some highlights of the conference? MARIA-EUGENIA: For certain the Director’s Program, which will be held in a historical 15th-Century monastery in Segovia, about 100 km from Madrid and home to IE University, is a highlight. Another highlight is Tuesday night’s special event at the Círculo de Bellas Artes (Fine Arts Center) in the city center of Madrid, where we will enjoy some local cuisine and a passionate flamenco show! MATTHEW: For me, one key highlight is the preconference offerings. If you are new to EMBA, we have the EMBA Toolkit, which is a great course on all aspects of EMBA operations. If you are a director, we have the Director’s Program, which will help you become more innovative in your work. The plenary sessions are very high quality and set the tone for the concurrent sessions. I think we have a really good mix. What is special about this year’s location in Madrid? MATTHEW: It’s a global center of business and finance and home to great business schools. It’s a different destination for EMBAC. It’s a vibrant European capital. It’s really a great city. The Director’s Program is in a very historic location in Segovia. MARIA-EUGENIA: Madrid is a beautiful and vibrant city where you can enjoy some tasty tapas while taking in the city’s stunning architecture, watch a flamenco show, or a soccer match at the Bernabéu or Calderón, enjoy excellent theater, or simply stroll through the Retiro Park – 350 acres of centennial trees and flower gardens, a crystal palace, and a lake where you can paddleboat or just relax and take in nature – all in the center of the city. Madrid is an easy city to fall in love with. Register for the 2018 conference, set for Oct. 14-17, here.